(i) Started life as the “Thames Forth Express”, but when re-introduced in 1957, the name “Waverley” was deemed more appropriate. (ii) Lasted only 4 years in BR days, but the service exists in a form today, under a private train operator: “East Midlands Trains”, operating on weekdays only. Of the 24 named trains running in the 1950s and 1960s, 7 had been introduced by British Railways, whilst the two oldest – the Irish Mail and the Royal Scot eventually managed to clock up more than 75 years in operation. The shortest-lived service – the St Pancras to Nottingham Midland, the Robin Hood, still has the vestiges of the named train run in BR days, but only on weekdays. In addition it keeps the old HST / InterCity 125 sets in operation on the up run from London to Nottingham – some 45 years after their first introduction. The 7-car Class 222 multiple units operate the up service, whilst the 6-car sets with a pair of Class 43 HST power cars and Mark III coaches run in the down direction. That said, on the London Midland Region of BR, this was definitely not the most well known, or popular express passenger service, and especially in the days of locomotive hauled trains, that honour went to the 10:00 from London Euston – known throughout its 70+ year working life as the “Royal Scot”. Although in later years, its northbound departure time was progressive put back, and by 1960, the train set off from Euston a 09:15, and scheduled to arrive in Glasgow at 16:15. Considering that 1960/61 was around the middle of the massive modernisation and re-equipment programme, a 7-hour timing was not bad – but, there were often delays. In fact, the West Coast Main Line, from LNWR and LMS days until the middle British Railways era was home to a number of famous trains. Of course it ran on Sundays too, but with extra stops. No fewer than 10 of these named trains were introduced in 1927, as the LMS was competing with its East Coast rival, the LNER, for the Anglo-Scottish passenger traffic. The “Royal Scot” service was introduced in that year, and it was hoped that the new locomotives from the North British Loco Co would arrive in time for the new timetable. In late 1927, the new engines were available to work the long distance Anglo‑Scottish expresses, in particular, the London ‑ Glasgow “Royal Scot” service, and the “Mid-Day Scot”. The Mid-Day Scot was so named due to the departure of the southbound and arrival of northbound being within 30 minutes of 1 pm. There were 6 named express services that provided links with the ports of Holyhead, Liverpool, Heysham and Stranraer for the cross Irish Sea ferry services. Of these, the “Irish Mail” was perhaps both the most well known, and the oldest named express passenger train. This was followed closely by the “Ulster Express”, which was originally launched as the Belfast Boat Train service by the Midland Railway, from St Pancras to Leeds, Lancaster, and on via Heysham. Before 1923 the LNWR operated a boat train service from Euston to Fleetwood, but following the amalgamations, the LMS moved its service to the more modern port facilities at Heysham, and from 1927 onwards it became the “Ulster Express”. The “Irish Mail” express operated out of Euston at 08:30, to reach Holyhead, where a connection was made with the LNWR steamer to Dublin, via Dun Laoghaire or Kingstown. A mid-day service from Euston at 13:20 connected with a Holyhead to Dublin (North Wall), whilst a dining car express from Euston left at 19:30 for Holyhead again, and connected with the LNWR’s steamer to Greenore. That was not the end of the story either, as the final service, the night “Irish Mail” left Euston at 20:45 for Holyhead, and connected with the ferry to Dublin via Kingstown, and was followed by another boat train service from Euston at 22:15, followed by a ferry to Dublin (North Wall). So, the named expresses operated on the Irish Sea routes had a fairly long and varied history, with all still operational in BR days. It was added to in 1954, by the introduction of the “Emerald Isle Express”, also on the Euston to Holyhead route, which left Euston at 17:35, and allowed passengers to change to the cross-sea ferry at Holyhead well before midnight. Interestingly at the peak of the years of the economic depression of the 1930s, the LMS introduced five new, named, express passenger trains. These were targeted at the passenger traffic to and from Manchester and Liverpool, alongside a more intriguing service from London Euston to Workington, by way of the old Cockermouth, Keswick and Penrith line – the “Lakes Express”. It was a curious mix of year round, and summer only daily workings. The year round service was from Euston to Windermere, whilst in summer, the extension to Penrith, Keswick and Workington was added. The “Lakes Express” left Euston at 12 noon, and at Wigan a stop was made to allow a connection to Southport, and detach through coaches for Preston and Blackpool. At Lancaster, through coaches for Barrow-in-Furness and the Cumberland coast to Workington were detached. With a stop at Oxenholme, the final coaches for Penrith, Keswick and Workington were sent on their way, and the last portions of the “Lakes Express” reached Workington at 19:26. However, in the extract from the timetable shown, the arrival at Workington was 19:53 for weekdays, with an 11:35 departure from Euston – over ½ an hour longer than its official pre-war schedule. That said, like many others, timings on the West Coast Main Line were impacted and considerably slowed by electrification work at the time, although this ultimately led to much shorter journey times after the work was completed. In the 1960s a new service carrying the name “The Night Limited”, left Euston at 21:50, for Glasgow, arriving at Central Station at 06:30, but carried first class passengers in sleeping berths only, and boasted a “Night Cap Bar” coach. This train was derived from the pre-war “Night Scot” service, which was a heavily used train, with 1st and 3rd class sleepers, but lost its name after WW2, and ran from Euston at 23:40. By the 1960s and the completion of electrification, the train was named again, and acquired its new departure time. But by the mid 1960s, the 24 named express trains running in the late 1950s had shrunk to less than half, with just 11 express passenger workings retained from the original, but the overnight sleeper from London to Glasgow was formerly named. By the end of the decade, 14 named express services had gone, and 4 had been added. British Railways in the 1970s was gradually becoming British Rail, with its corporate image, and double arrow logo. But the London Midland Region still offered 7 weekday named trains in the 1972/73 timetable. Although the number of workings was reduced still to 4 on a Saturday and Sunday, these did include the “Thames-Clyde Express” from St Pancras to Glasgow Central. The “Royal Scot” left Euston at 10:05, with a timed arrival in Glasgow at 16:42, and in the up direction, from Glasgow to London, the journey started at 09:25, arriving at Euston at 16:00. Just 8 years earlier, the same train was timed at 10:00 from Glasgow, with a 17:10 arrival at Euston – just 35 minutes longer. Quicker – yes – but only by just over half an hour. The “Night Caledonian” is included in the 1970s list above, but was a short lived sleeper service between London and Glasgow, and was discontinued in 1977, whilst the older “Night Limited” continued until 1987. In 1966, electrification had reached both Manchester and Liverpool, and two locomotive hauled express trains – “The Manchester Pullman” and “The Liverpool Pullman” were running from Euston. Manchester’s old London Road station had been rebuilt, remodelled and renamed Piccadilly, and the down Pullman was timed to reach Manchester in 2 hours 33 minutes, with an 07:55 departure from London. The equivalent service to Liverpool actually set off 5 minutes earlier at 07:50, arriving at Lime Street station by 10:24 – timed for 2 hours 34 minutes. At this time, with the exception of the “Thames-Clyde” express, the Anglo-Scottish services were electrically hauled to Crewe, and replaced by diesels – typically the English Electric Class 50 – for the rest of the journey north. Until of course, the electrification from Crewe to Glasgow was completed in 1974. The very next year, 1975, saw the St Pancras to Edinburgh “Thames-Clyde” express disappear, whilst the “Irish Mail” lasted another decade or so, but it too went in the 1980s, together with the “Royal Highlander”, the Euston to Inverness sleeper service. A little ironically perhaps, Virgin Trains applied the name “The Irish Mail” to one of the HST/IC125 power cars it operated in 1998. The HST sets never operated on the West Coast Main Line, and not on the Holyhead bound service, so perhaps this was a reference to the similar service operated by the Great Western from Paddington to Fishguard. During the British Rail era, named trains on the London Midland were still regular turns, albeit much fewer in number, but all were then run under the “Inter-City” brand, as the railway’s sectorisation strategy was implemented. Inter-City services made substantial profits for BR during those years and into the 1980s, with the “Royal Scot” and “Irish Mail” still in operation, alongside the “Royal Highlander”. But by the end of the 1980s, they had all gone, as fixed formation train sets, and ultimately, the “Pendolino” trains took over the express passenger workings on the Anglo Scottish, West Coast Main Line. Of course, that covered all of BR’s five regions, and in this short piece it is just a reflection of what had happened on the London Midland Region, from it’s high of 24 formally named, down to just 6 in 1978. Only 4 of these remained in the 1980s, with the “Irish Mail” service that started in 1905 under the LNWR, coming to an end after 80 years, in 1985, at the same time, the relatively new “Manchester Pullman” also disappeared. The final two named trains on British Railways’ London Midland Region – under the British Rail InterCity brand – were the daytime “Royal Scot” and “Royal Highlander” sleeper service, both of which started life in 1927 as an LMS service. Such a shame that the names have all gone now, but then the appearance of the 21st century trains themselves – though fast and efficient – does not have the same appeal or glamour of the steam, diesel and early electric locomotive hauled services of previous years. A kind of non-answer, and with hindsight this seems to be an inaccurate response. During this time too, two Transport Acts (1981 and 1985), which privatised and deregulated sections of the road transport industry came into full effect. In 1980, the National Freight Corporation was privatised, and certain rail/shipping/road integration activities were abolished, with changes to regulations about public service vehicles (buses). This was a precursor to the full-blown privatisation of buses that occurred after the 1985 Transport Act, and which led to chaotic urban transport operations in many areas of the country. On top of this, there was the controversial “Serpell Report” of 1983, which aside from its other findings, seemed to consider BREL workshops as an odd asset to be owned and operated by the national rail industry. But the impact of the changes that occurred in the 80s was more than just about numbers, and the tragic consequences for many families dependent on these engineering works – this was equally as much about the loss of skills, training programmes, and technical and technology development. Between 1980 and 1985 innovation had seen the end of projects such as the APT, where the technology was later adapted within the “Pendolino” series of trains, but produced under a combination of Fiat and Alstom. The private sector had an extensive partnership with the railway workshops too, and during this time the last major innovations from Britain’s railway industry included heavy involvement in the original Eurostar trains, and of course the ‘Le Shuttle’ locomotives. It could be argued that the completion of the Channel Tunnel, and the arrival of the TMST (Trans Manche Super Trains) marked the final chapter in the UK’s railway engineering expertise. Closure of the railway workshops would affect the likes of GEC, Metro-Cammell, Brush and others. During the 1980s, some of the most well known, indeed world famous railway works were scheduled for closure, including: Ashford (1980); Derby Locomotive Works (1990); Horwich (1985); Swindon (1986); Wolverton Carriage Works (1980) – better know today perhaps for a nearby town with concrete cows. In addition to these major works, that disappeared completely, others were reduced to a mere fraction of their former size, and none were permitted to compete for other engineering work beyond British Rail orders. They had the skills, but the official policy of the day did not permit those skills to be used. The last orders for British Railways workshops to build new locomotives, was for the ill-fated Class 58, constructed at Doncaster Works from 1982 until the last of the class was completed in 1987. The works took on a role as the national locomotive stores in 1986, and parts of the site demolished, with other areas sold to Bombardier, and the US company Wabtec. For the next 20 years the remnants of the works remained in use with small orders for repairs and maintenance, and parts for train equipment, including braking systems until it was finally closed in 2007. On the 20th December that year, plans were reported in the press “ … to turn the land into a massive housing, retail and business complex …”. A sad end to a 153-years-old engineering history. But these stories were repeated elsewhere, and perhaps one of the most well known and reported was that of Swindon Works, originally over 360 acres in extent, it closed in 1986, and the site put up for sale. Following a reorganisation begun in 1962, it was planned that the loco works would continue, but with a reducing workforce – as steam power disappeared. By 1966, the old carriage and wagon works had been closed, and a new apprentice training school was built, and Swindon had a total workforce of 5,320 at that time. That was despite the loss of over 2,000 men in 1963 and 1964. Swindon too had built up skills in the new technology of diesel traction – with both hydraulic and electric transmission – from the new “Warship” and “Western” class main line diesels, to refurbishing multiple units, including electric multiple units for other regions. In March 1960, Britain’s last steam locomotive “Evening Star” was completed at Swindon, and 20 years later at the start of the 1980s, Swindon built twenty 0-8-0 diesel-hydraulic locos for the metre gauge railways of Kenya. Of course, the skills developed to support hydraulic transmission was rendered unnecessary, since British Railways had decided that all future traction would be fitted with electric transmission. A similar problem befell the North British Loco Co in Glasgow, who had built BR’s first main line diesels for the Western Region. During the early 1980s less and less repair and maintenance work was undertaken at Swindon as part of the recently formed British Rail Engineering Limited, which was seen mostly to be awarded to Crewe or Derby, and with the embargo on bidding for non-railway work, the decline of the works was perhaps inevitable. The loss of engineering skills, and the loss of engineering apprenticeship opportunities was clearly bad for future prospects. It is well known, that like many “engineering towns” across the country, from Birmingham to Barrow-in-Furness, or Doncaster to Derby, the railway works at Swindon employed generations of the same families. Ironically perhaps, some of the coach building skills were transferable to bus companies, and some of the men employed at Swindon were able to use those skills in the road transport industry. The year after closure, in 1987, when 1500 people lost their jobs, the works were bought by Tarmac Swindon Ltd, with the intention of building a complete new community – housing, retail, etc. – which it thought to name ‘Churchward’. A few years later plans were approved to include a new railway museum in the remaining buildings, ‘R Shop’, which today is known as the “Steam Museum of the Great Western Railway” (https://www.steam-museum.org.uk/Pages/Home.aspx ). Another railway town hit hard by the dramatic loss of jobs and skills from the railway workshops in the 1980s was Horwich in Lancashire. 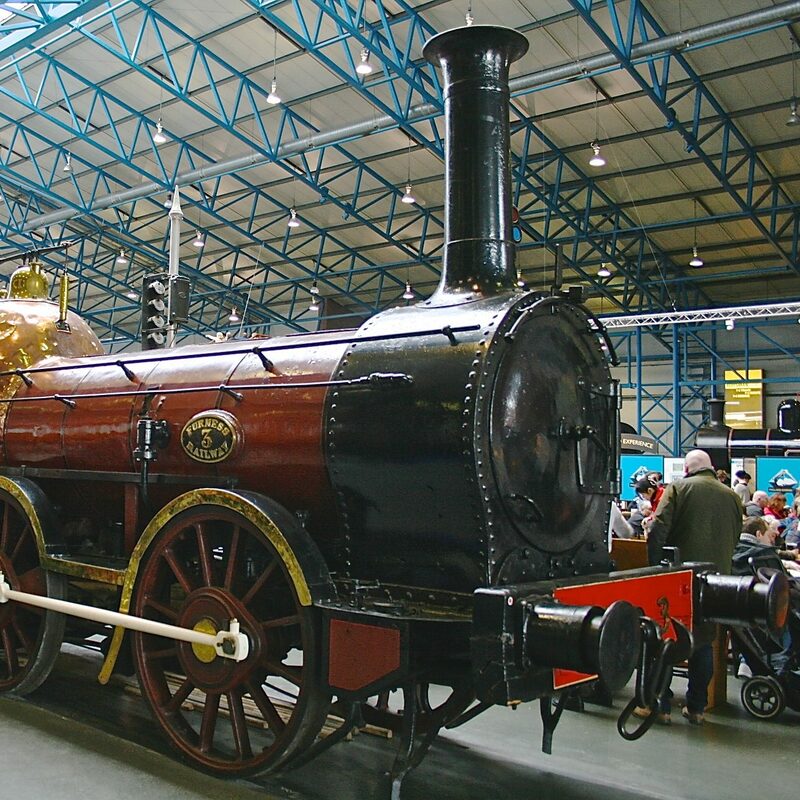 There was both a locomotive works and a wagon works in Horwich – the loco works was established by the Lancashire & Yorkshire Railway, in the Victorian Era, whilst wagon building only started in 1963, when the work was transferred from the nearby Earlestown Wagon Works. Horwich Works covered some 81 acres, and was begun in 1887, lasting just about a century until 1985, when it too closed. It had been expanded during its life, and in the post WW2 era had a covered area of over 150 acres, and had churned out artillery pieces, tanks, aeroplane parts and shells during the war. As a locomotive works it was closed in 1963/4, but had turned out 35 of the new BR Standard Class 4 2-6-0s in 1952 and 1956, and continued to repair and maintain many other loco types until closure. The last steam type to be overhauled at Horwich was a Stanier 8F 2-8-0 No. 48756, completed on 4th May 1964. At the end of 1966, 2492 people were directly employed in the works, on wagon building but by 1983 this had been reduced to 1400, and 3 years later the works closed finally with the loss of 300 jobs. Some small-scale engineering activity continued for a time, when BREL sold the site to the Parkfield Group in 1988, and the following year the rail connection was removed. The site became broken down into numerous industrial units on what was named the “Horwich Loco Industrial Estate”, and many of the buildings are still in use today. Horwich Railway Works heritage is not forgotten either, and the Horwich Heritage Centre (http://www.horwichheritage.co.uk/index.php ), located nearby, remains committed to telling the story of the men and women who worked at Horwich and their engineering achievements over the years. Unsurprisingly, the ongoing run down of the railway workshops in the 1980s, despite suggested opportunities to win export orders, to a degree considered possible by the government, the impact of the changes was greeted with much scepticism by MPs. “Mr. Snape: Does the Secretary of State accept that since the Conservative party took office, the railway works at Shildon, Stratford and most of Horwich have closed? Does he accept that Swindon is scheduled shortly to close and that the works at Glasgow are also under threat? Does he accept that up to 12,000 further redundancies in BREL are threatened and that it will take more than the disgraceful slur from his creeping hon. Friend the Member for York (Mr. Gregory) to alter that? Judging by what we know occurred in the 1980s, Peter Snape’s estimate of 12,000 further redundancies was about ½ way through this “slimming down” of BREL. Part of the government minister’s reply was interesting too:The works did close in 1984, and 1,750 jobs were lost – jobs and skills – and in the debate, the local MP referred to the many jobs and livelihoods that were at stake, and indeed would be lost when the works closed. At that time too, the economic recession had hit industry hard, and it was cited that British Rail had given as a justification for closure the over valued pound, “….the tight financial limits that have been imposed by the Government….” the failure to win export orders, and the recession. Four more wagon and coach building works also closed in the early 1980s – Ashford, Temple Mills (W. London)Townhill (Dunfermline), and Wolverton – leaving York as BREL’s only remaining rolling stock workshop, and a dependence on private contractors for new vehicles. Another notable loss of the decade was the St Rollox works in Glasgow. Here, the existence of both Cowlairs and St Rollox in the same area had led to the concentration of activity at St Rollox, when work was transferred from Cowlairs after its closure in 1968, and the loss of more than 1,000 jobs. In 1988, as BREL was being put up for sale – which was something that the government had indicated was not included in its earlier Transport Act – St Rollox was also closed, with a loss of 1,206 jobs. Seen against the background of the run down of other engineering industries in and around Glasgow, especially shipbuilding, this was a dramatic blow to the economy, and with little by way of other industry to absorb these changes. Looking back at the 1980s, the decade had seen immense change in the railway industry, and manufacturing, which left Britain poorly prepared for any growth in rail transport, and yet, in that same decade, British Rail had proposed an investment programme for the building of hundreds of items of rolling stock and locos. An optimistic view to say the least, as the closures continued. This, despite the sale of BREL to a consortium of ABB, a MEBO (Management Employee Buy Out), and Trafalgar House (a finance company). Overall, yes the world of work was changing, and the lack of investment and development of core industrial strategies, together with the economic recession of the 1980s would prove to be a turning point. The continued loss of the skills and technological development over many decades would ultimately prove the final nail in the coffin of the UK’s railway engineering industry, and the technical lead it had established over its competitors. It could equally be argued that these had little impact on the railway manufacturing businesses, and the workshops in particular, but the general trend was towards fragmentation and disassembly of a national industry, and the loss of skills and opportunities for economic development in those fields. Of course, the UK did still have a fairly extensive private sector railway manufacturing industry, with the likes of GEC Traction, Brush Electrical Engineering, Ruston Paxman, and Metropolitan Cammell, amongst others still winning orders – mainly for export it may be said, but there was little growth. Job losses from the railway workshops would not be absorbed by the private sector, and the long-term prospects were poor. In the end, before the railways were privatised, former British Railways workshops played their part in delivering innovative technology, before the wilderness years of the 1990s.